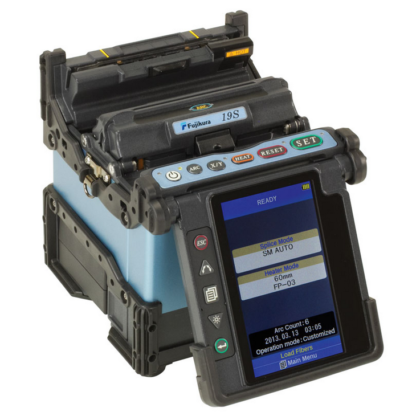 The <b>Fujikura 19S Fusion Splicer</b> is a low cost, fixed v-groove single fiber splicer with similar features found on the Fujikura 70S. Incorporating the proven ruggedized features pioneered by Fujikura, the Fujikura 19S Fusion Splicer has added automated and enhanced user control features to increase splicing efficiency. A user programmable, automated wind protector expedites the splicing process by automatically closing to initiate the splice process, and opening upon splice completion. Fully programmable “auto open sheath clamps” open one sheath clamp, after the tensile test, to prepare the fiber for removal. A new automated “clamshell design” tube heater applies heat to both sides of the splice protection sleeve resulting in a faster shrink time. Ruggedness and durability are greatly enhance by a mirror-less optical system and “severe-impact resistant” monitor. An innovative transit case doubles as a built-in or mobile workstation and makes splicing easier than ever before.